The Archbishop of Canterbury Church, Justin Welby, expressed his concern about the humanitarian situation in Yemen due to the Saudi military campaign taking place in the impoverished country. He called during his meeting with Saudi Crown Prince Mohamed bin Salman in London to end the war, while the latter promised to promote interfaith dialogue. 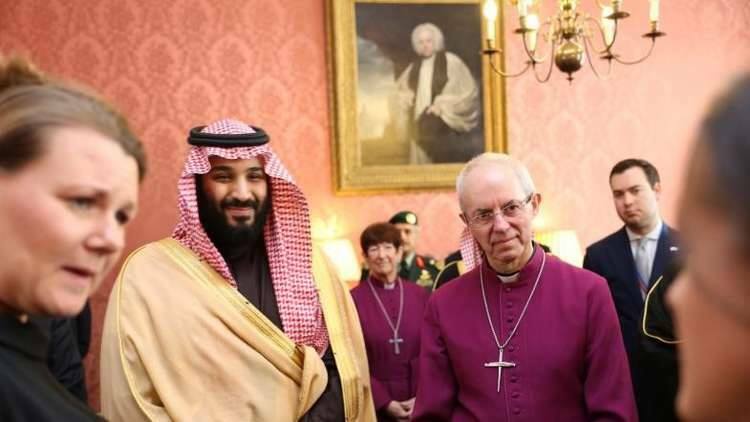 A statement issued by Welby’s office said that he expressed his “sorrow” for the humanitarian situation in Yemen and that he called on Ibn Salman to do all in his power to alleviate the suffering of civilians and end the war there. The two men held an hour-long meeting at the Lambeth Palace in London and reviewed a selection of the first texts of Christian, Islamic and Jewish religions, the statement said. This comes a day after Queen Elizabeth II received bin Salman for lunch and then agreed with British Prime Minister Theresa May to increase bilateral trade worth 65 billion pounds ($ 90.30 billion). On the other hand, the British opposition leader, Jeremy Corbyn, has been accusing his government of colluding with Ibn Salman in the war against Yemen, while demonstrations in London were held by activists to express their refusal of exporting arms to Saudi Arabia over the killing of innocent civilians in Yemen.